Planned shuttle mission to reboost Skylab space station to higher orbit for use by shuttle. Before the first shuttle flew, Skylab burned up in the atmosphere and crashed into the Australian outback on July 11, 1979. Launched: 1979 Late. Number crew: 2 . In late 1977 shuttle orbital missions were due to start in 1979. The orbiting Skylab space station was not expected to decay until 1983. A plan to save Skylab was developed. In Phase 1a small Skylab Reboost Module would be docked to Skylab on the second Shuttle flight. This would boost the station to a higher orbit for later use, and also provide the capability of deorbiting the station into empty ocean if the decision was taken to abandon it. Astronauts Haise and Lousma were selected for this flight, and development of the reboost module was begun. But it was not to be. Aside from intense resistance from some factions at NASA headquarters, higher solar activity resulted in heavier than predicted drag on Skylab. The shuttle program also was hit with delays. Before the first shuttle flew, Skylab burned up in the atmosphere and crashed into the Australian outback on July 11, 1979. Phase 1 - A small Skylab Reboost Module would be docked to Skylab on the second Shuttle flight and boost it to a higher storage orbit. Phase 2 - In two shuttle flights, Skylab would be refurbished. In January 1982, the first mission would attach a modified Apollo-Soyuz docking adapter, test the thermal control system, install valves for repressurization, and reactivate all power buses. In August 1983, a second crew would install thermal and electrical units, service the thermal system, and conduct more extensive inspections and checkouts to assess the effects of exposure on solar cells, insulation, windows, seals, paints, film, lubricants, and other materials. Phase 3 - Beginning in March 1984 shuttle crews would attach a solar-powered Power Expansion Module, refurbish scientific equipment, and conduct 30 to 90 day missions. The existing Apollo Telescope Mount and the earth resources experiments would be used. Phase 4 - From 1985 to 1989 Skylab would be expanded into a true space depot for up to eight astronauts. Additions would include a large docking/interface module, additional logistics modules, Spacelab modules and pallets, and an orbital vehicle space dock using the shuttle's external tank. Equipment for the first three phases was estimated to cost about $60 million, not including launch costs or the power module, which were already budgeted anyway. It would have provided the shuttle with a space station with which to operate - its original design mission - twenty years before and at a few percent of the cost of the later International Space Station. People: Haise, Lousma. Spacecraft: Space Shuttle. STS-2A (cancelled) - . Crew: Haise, Lousma. Nation: USA. Related Persons: Haise, Lousma. Program: STS. Flight: STS-2A. Spacecraft Bus: Shuttle. Spacecraft: Columbia. In late 1977 shuttle orbital missions were due to start in 1979. STS-2, the second shuttle flight, was to have rendezvoused with the Skylab space station and released a small Skylab Reboost Module. 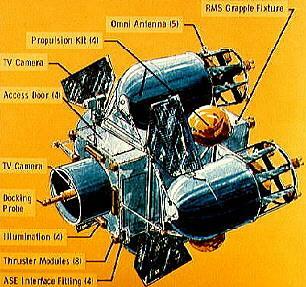 This would dock to Skylab and boost the station to a higher orbit for later use. But the shuttle program also was hit with delays and before the first shuttle flew, Skylab burned up in the atmosphere and crashed into the Australian outback on July 11, 1979.